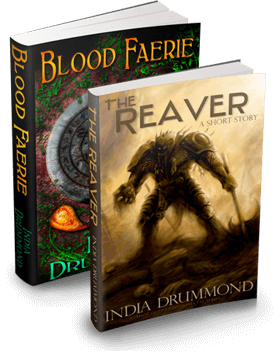 Get Blood Faerie, the first book in India's bestselling Caledonia Fae Series, free as well as The Reaver, a short story available free exclusively for subscribers to my newsletter. You have been subscribed. Watch your inbox and confirm your email address. © 2016-2019 India Drummond, Trindlemoss LLC. Unauthorized use and/or duplication of this material without express and written permission from the author is strictly prohibited. Excerpts and links may be used, provided that full and clear credit is given to India Drummond with appropriate and specific direction to the original content.